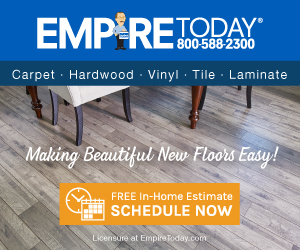 For over 55 years we have been committed to help customers find quality Carpet, Flooring and Window Treatments, and strive to leave a positive impression from start to finish. We appreciate you making us aware of your concerns, and assure you that we take matters such as this one very seriously. We’ll be following up with you shortly to further review your concerns. Do not use Empire Today in the Austin/San Antonio district. This has easily been the worst customer service experience I have ever had. This has been an absolute nightmare. The notes on our account with customer service is probably 5 pages long. We know the GM by first name: Rex Its evident their respective departments do not communicate and work independently to a fault. The Sales department hooks you, Installation sub-contracts at the lowest price, and Customer Service is just a messenger service to the various employees in charge of the customers job. Here is an abridged version: -5 rooms: 2 laminate; 1 tile; 2 carpet (originally laminate). -Paid in full up front. -Scheduled the installation on our honeymoon so the house could be empty for the job; my sister took off work for the install. -Scheduled May 25 and as of July 5, 1 room left -Sales Rep informed us of potential extra installation costs, but contractor quoted $2000 to level floors to install laminate in 2 rooms; if wed been told by the Sales Rep, the individual responsible for quoting the job, that laminate flooring would be significantly more then we wouldve chosen carpet. -1st contractor advised us to cancel the contract with Empire so he could do the job $500 cheaper. Seriously. -Scheduled and rescheduled more than 5 times because Ive lost count -GM Rex plays phone tag. He would call and leave a voicemail at 4:45 P.M.
on a Friday, but call back within 10 minutes and Customer Service picks up and directs you to his voicemail. This happened twice. -8 hour windows; lucky if they show up -Wife and sister lost days of income from waiting around for contractors that never showed up -Brought wrong color carpet the first time. -Scheduled one room for July 4th. It seemed odd so we called Customer Service multiple times to confirm the date and time which they verified. The evening of July 3rd, they call to confirm the 5th We are just ready to wash our hands of them and their business. I just want to tell as many people as possible do NOT use Empire Today. Review #1070352 is a subjective opinion of j.hurst.